Chapters: I. Polynomials. II. Holomorphic Mappings. III. Domains of Holomorphy. IV. Differentiable Mappings. V. Differential Forms. VI. Polynomially Convex Domains. VII. 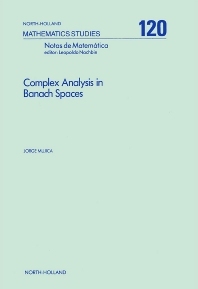 Commutative Banach Algebras. VIII. Plurisubharmonic Functions. IX. The &dgr; Equation in Pseudoconvex Domains. X. The Levi Problem. XI. Riemann Domains. XII. The Levi Problem in Riemann Domains. XIII. Envelopes of Holomorphy. Bibliography. Index. Problems arising from the study of holomorphic continuation and holomorphic approximation have been central in the development of complex analysis in finitely many variables, and constitute one of the most promising lines of research in infinite dimensional complex analysis. This book presents a unified view of these topics in both finite and infinite dimensions.